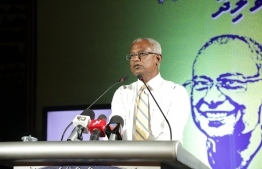 Opposition coalition's presidential candidate Ibrahim Mohamed Solih (Ibu) vowed to increase the salaries of all workers encompassing the health sector, should he win the upcoming elections. While speaking at Velidhoo, Noonu Atoll, amidst the opposition coalition's campaign trail to the atoll, Ibu emphasized that workers in the health sector are underpaid and often overlooked. "We haven't seen the full appreciation of workers in the health sector. They are underpaid. We will revise the payment system of the salaries for these employees and reward them with feasible pay", said Ibu. Criticizing the system of the current government's health sector, Ibu disappointedly pointed out the misuse of the healthcare insurance scheme, 'Aasandha' and the struggles of individual patients to fund their medical treatment. Furthermore, Ibu vowed to ensure fair access to the 'Aasandha' scheme for all civilians, as well as fair arrangement of the health scheme to private hospitals and clinics. Additionally, Ibu revealed plans to establish and develop four main, innovative hospitals throughout the Maldives. "Maldives is in dire need for a better health system. Even in the 21st century, we only have high-development hospitals only in Male. Other areas in the Maldives should also have the advantage of state-of-art medical equipment that can supplement patients suffering from life-threatening conditions", said Ibu. Additionally, Ibu revealed plans to establish a National Mental Health Institute in order to encourage the importance of mental wellness, in an opposition-led government. The opposition coalition has currently exceeded a hundred campaign stops, with Velidhoo being the 109th stop.